Turkey's high-flying economy, which expanded at a 10 percent annual rate of gross domestic product growth during the first half of 2011, will crash-land in 2012. Prime Minister Recep Tayyip Erdoğan's "economic miracle," to use the Daily Telegraph's admiring words, depended on a 40 percent annual rate of bank credit expansion, which in turn produced a balance of payments deficit as wide as that of southern Europe's crisis countries. Markets have already anticipated a sudden turnaround in the Turkish economy. The Turkish lira (TRY) fell by a quarter between November 2010 and September 2011, making it the world's worst performing emerging market currency. The stock market has fallen in dollar terms by 40 percent, making Turkey the worst performer after Egypt among all the markets in the MSCI Tradable Index during 2011. 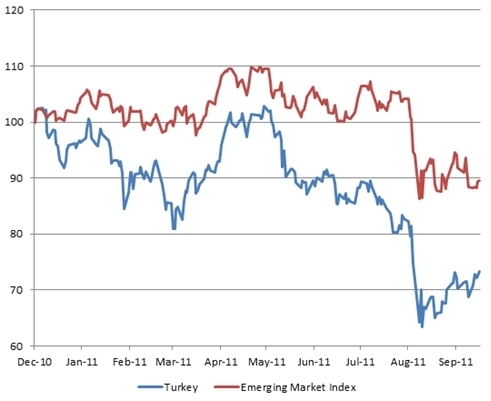 (See Graph 1 for Turkey vs. emerging markets.) And most analysts now expect that the cyclical slowdown will uncover deep deficiencies in Turkey's labor force and infrastructure, leading to a prolonged structural slump rather than a passing recession. The suddenness and size of this economic setback will in most likelihood erode the ruling Justice and Development Party's (Adalet ve Kalkınma Partisi, AKP) capacity to govern on the strength of pragmatic success rather than Islamist ideology; will undercut its ability to use economic incentives to defuse Kurdish separatism and contain domestic opposition; and will weaken Ankara's claim to a leading regional role. Turkey's predicament follows a well-known pattern of Third World economic crises driven by external imbalances. The impetus behind the country's recent economic growth has been a stunning rate of credit expansion, which reached 30 percent for households and 40 percent for business in 2011. By contrast, inflation-adjusted consumer credit growth in the United States from 1984 to 2008 peaked at just 12 percent in 1995. The banks aligned with the AKP, that is, the four Shari'a-compliant banks (or participation banks), have increased their consumer loans at a much faster rate than the conventional banks. In the year through September 16, 2011, consumer loans by the Islamic banks rose by 53 percent, according to the Central Bank's data base, compared to 36 percent for commercial banks. The Islamic banks have lent TRY 5 billion to consumers, about a quarter as much as the commercial banks. In the past two years, the ratio of debt to disposable income in Turkish households rose from 35 percent to 45 percent. This growing demand was far in excess of what domestic output could satisfy. Graph 2 shows that the current account deficit widened accordingly as credit demand rose and the marginal dollar of consumer demand went to imports rather than domestic purchases. As Graph 3 illustrates, this import surge was dominated by consumer durables, which rose by 60 percent between 2003 and the middle of 2011. 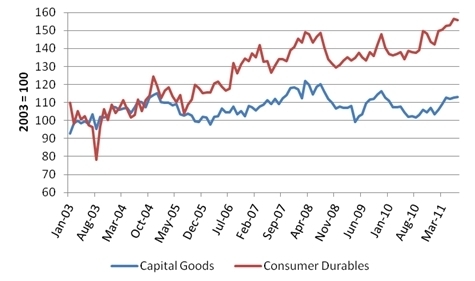 Imports of capital as well as intermediate goods for industry, by contrast, actually fell from the 2008 peak. Turkey, in short, is running a current account deficit equal to 11 percent of GDP to promote a consumer buying spree while cutting imports of capital goods that would contribute to future productivity. Not only are the size and content of this current account deficit problematic, but it is shakily financed as well. Only 15 percent of it is funded by foreign direct investment. The rest comes from portfolio flows, which made their way to Turkey and other emerging markets in search of higher yields when recession hit Western economies in 2009. Short-term lira-denominated debt held by banks and hedge funds finances most of this enormous deficit. Until the end of 2010, high-yielding foreign deposits in the Turkish lira accounted for virtually all of the debt. As the country's currency began to depreciate, though, foreign investors reduced lira deposits, forcing Turkey to finance its current account deficit in dollars. The country's overall debt levels remain low compared to the weaker European countries, but the growth rate is alarming. To correct it will require a severe retrenchment of domestic consumption. The market is worried about Italy, whose debt has an average maturity of seven years. Turkey's foreign debt has short maturities and has doubled in the last year and a half. In some respects, Erdoğan's bubble recalls the experiences of Argentina in 2000 and Mexico in 1994 where surging external debt produced short-lived bubbles of prosperity, followed by currency devaluations and deep slumps. Both Latin American governments bought popularity by providing cheap consumer credit as did Erdoğan in the months leading up to the June 2011 national election. Argentina defaulted on its $132 billion public debt, and its economy contracted by 10 percent in real terms in 2002. Mexico ran a current account deficit equal to 8 percent of GDP in 1993, framing the 1994 peso devaluation and a subsequent 10 percent decline in consumption. At roughly 40 percent of GDP, Turkey's overall external debt is comparatively low—the external debt of Greece stands at 137 percent of GDP while Portugal's is 217 percent of GDP—and it will have no foreseeable problems servicing it. Nevertheless, Turkey is ill prepared to recover from a major economic shock. It lacks the natural resources that have buoyed the exports of Argentina and other Latin American countries. It is a net importer of food. 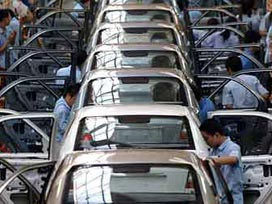 The automotive sector took the largest share of Turkish exports in 2011, but some of Turkey's most important export markets are in sharp decline. Moreover, some of Turkey's most important export markets are in sharp decline. Between 2002 and 2010, the share of the country's exports taken by the Middle East and North Africa doubled to 26 percent from 13 percent. The economic decline associated with this year's instability in the Arab world will constrict Turkish exports. Although Turkey has reduced its trade dependence on Europe from 56 percent of total exports in 2005 to 46 percent in 2010, Europe's economic problems will still weigh heavily on Turkey's recovery. By contrast, Ankara exports very little to Asia or Latin America, the fastest-growing parts of the world economy. Given its fragile export profile, Turkey's current account deficit can be forcibly narrowed only through economic contraction. A reduction of Turkey's current account deficit from 11 percent of GDP to a manageable 3 percent would require a reduction in imports equal to 8 percent of GDP. This, in turn, implies severe retrenchment of domestic consumption and, possibly, a deep recession. Turkey's central bank attempted to staunch the bleeding in the current account earlier this year by reducing interest rates. Lower interest rates depressed the Turkish lira by discouraging capital inflows. A weaker lira is intended to make Turkey's exports more competitive, but with imports running at nearly twice the level of exports, the effect is rather to force up the price of imports and increase domestic inflation as well as the current account deficit. 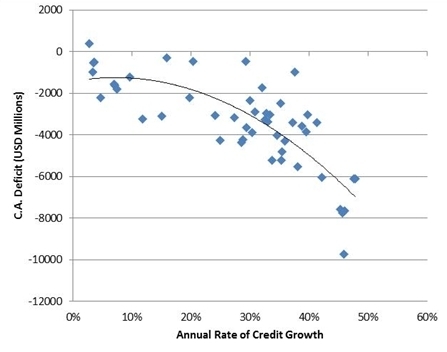 Although the central bank raised reserve requirements with the aim of restraining credit growth, consumer credit was still expanding at a 35 percent annual rate during the three months through August 2011. A serious and probably quite painful "adjustment" is inevitable in the short-term, in order to bring current account deficit to more "normal" levels. … This can't happen with a weaker currency alone; growth will also have to slow visibly. Second, an excessive CAD level points to a structural weakness in the economy. It simply attests to our inability as a nation, to put forth enough of a presence in the global supply chain of goods and services. Put differently, it implies that our average dollar-based income—per capita as well as per worker, which runs around $10,000 and $30,000, respectively—is simply too high, compared to our average productivity levels. By this interpretation, the current account deficit represents nothing but a structural deficit in our skills and institutions. On October 3, 2011, Goldman Sachs equity analysts issued a sell recommendation on Turkey's largest bank, Garanti Bakasi, warning that it is "exposed to deteriorating banking dynamics should Turkish economic growth turn to a recession, an outcome that Goldman economists are now assigning a relatively high probability." Turkey faces not only a sharp reversal of economic fortunes in the short term but also formidable obstacles to recovery in the medium term. The country has no natural resources with which to emulate Brazil or Russia and lacks the human capital to compete with emerging Asia. Although its universities train some excellent engineers and managers, the population as a whole is poorly educated in comparison with other middle-upper income countries. Only 26 percent of Turkish children graduate secondary school, compared to 44 percent in Mexico, 64 percent in Portugal, and 83 percent in Poland. Low-value added products (textiles, apparel, furniture, appliances, autos) dominate its export profile. Turkish industry has never succeeded in any field of high technology. Despite Anatolian success in medium-tech industries such as textiles and food processing, the deep backwardness of the Turkish hinterland remains a difficult hurdle. A fifth of Turkish marriages are consanguineous (to first or second cousins), about the same level as in Egypt. Traditional prejudice still prevents most Turkish women from working outside the home despite advancements in female education and a decline in fertility. Turkish women have lost ground in economic life: Only 22 percent sought employment in 2009, down from more than 34 percent in 1988. In contrast, 54 percent of South Korean women work. As smallholding agriculture shrinks, women who no longer can work on the family farm simply sit at home. The collapse in the female labor force participation rate is a striking gauge of the country's failure to modernize. Turkey's official unemployment rate stands at around 10 percent; adjusted for the underemployment of Turkish women, the unemployment rate would be above 25 percent. Roughly 43 percent of Turkish employment is off the books, compared to a developed-country average of 18 percent. Turkey's longer-term risks are even more daunting. A developing country cannot sustain a fertility rate that leads to a rapid increase in elderly dependents, yet the fertility rate of Turks for whom Turkish is a first language has been in steady decline over the past fifteen years, falling to only 1.5—equal to that of Europe—while its population is aging almost as fast as Iran's, leaving the country's social security system with a deficit of close to 5 percent of GDP. "If we continue the existing [fertility] trend, 2038 will mark disaster for us," Erdoğan warned in a May 2010 speech. Erdoğan is right: Should the trend continue, the Turkish economy will collapse under the strain of caring for its dependent elderly while the country's young people will be concentrated in the Kurdish minority, fueling demands for independence from the hard hand of the Turkish state. But Erdoğan's predicament is, of course, far more immediate. His government's reluctance to encourage greater savings at home does not bode well for Turkey's future. "This heavy reliance on external savings exposes Turkey to shocks," notes Standard and Poor's, "either domestic (for example if Turkey's recent high domestic credit growth resulted in future bad loans) or external (say, if rising risk aversion were to prompt foreign investors and bank credit officers to reduce exposure to Turkish entities)." According to Murat Üçer, the question is whether "Turkey can manage a soft landing or whether there'll be a correction because of external factors, which could be very ugly indeed." It's important to keep in mind that Turkey is a resource-poor country … We rely on the confidence of financial markets. … If Turkey goes in the Iranian direction, the financial markets will shut us out. The middle class will ship their money overseas, and many of them will move overseas, like Iran's middle class did after Khomeini's revolution. The country will collapse. As Erdoğan's economic miracle evaporates, his ability to govern will diminish. On the eve of the June 2011 national elections, Turks were "almost evenly divided about the current direction of their country" according to a Pew Research Center survey. Views about the economy were split down the middle with 49 percent saying that the economic situation was good, and 48 percent saying that it was bad, a meager result after two quarters of blistering GDP growth. A sharp religious divide characterizes sentiment about the overall direction of the country: 67 percent of those who "pray rarely" are "dissatisfied" while 64 percent of those who pray five times a day are "satisfied." The country's economic performance evidently tips the balance in favor of the AKP. AKP Islamists face entrenched and embittered opposition after three years of mass arrests of political opponents, journalists, and military officers on flimsy charges of coup plotting. While the silent majority of Turks acquiesced in this abuse so long as the economy was booming, this is likely to change in the wake of a major economic reverse, which will in turn undercut Erdoğan's efforts to project Turkish power abroad. "Turkey looks to punch above its weight," the London Financial Times recently commented. The trouble is that it is also punching above its strength. David P. Goldman, president of Macrostrategy LLC, is the author of How Civilizations Die (and Why Islam Is Dying, Too) (Regnery Publishing, Sept. 2011). He writes the "Spengler" column for Asia Times Online and blogs for Pajamas Media. Previously he was global head of fixed income research for Bank of America and head of credit strategy for Credit Suisse. The Wall Street Journal, Sept. 12, 2011. The Telegraph (London), June 12, 2011. The Wall Street Journal, June 30, 2011. One of these four banks, Bank Asya, is controlled by the Fethullah Gülen movement. Financial Times (London), Sept. 11, 2011. Jonathan Wheatley, "Turkey blows it," ibid., Aug. 4, 2011. Bloomberg Business News (New York), Sept. 20, 2011. The Wall Street Journal, Aug. 4, 2011. Murat Üçer, "How Should We Read Turkey's Current Account Deficit?" Center for Economics and Foreign Policy Studies (EDAM), Istanbul, pp. 4-5. Bloomberg Business News, Oct. 7, 2011. "Education Attainment," OECD Factbook 2010: Economic, Environmental and Social Statistics, Organisation for Economic Co-operation and Development, Paris, May 25, 2010. "Female Labor Participation in Turkey: Trends, determinants and policy framework," World Bank Report 48508-TR, 2009, Washington, D.C.
 Today's Zaman (Istanbul), May 25, 2010. Abdullah Takim, "Effectiveness of the Informal Economy in Turkey," European Journal of Social Sciences, no. 2, 2011. "Constant Fertility Scenario," World Population Prospects: The 2010 Revision, United Nations Population Prospects, New York, Aug. 25, 2011. Today's Zaman, May 10, 2010. Joe Parkinson, "Turkey's Recovery on Shaky Ground?" The Wall Street Journal, Sept. 22, 2011. Author interview, Istanbul, Feb. 2011. "On Eve of Elections, a More Upbeat Mood in Turkey," Pew Research Center, Global Attitudes Project, Washington, D.C., June 7, 2011. Daniel Dombey, "Turkey looks to punch above its weight," Financial Times, Sept. 27, 2011. Turkey's economy came to a dead stop during the first quarter, but the country's credit bubble continues to grow. Under the headline "Ankara's Economic Miracle Collapses", I argued a year ago in the Middle East Quarterly that Turkey's economic prowess had more hype than substance. The government of Prime Minister Recep Tayyip Erdogan had financed a consumer bubble with a huge trade deficit financed by short-term interbank loans. The consumer boom is gone, but the credit bubble continues, with bank lending still expanding by 30% a year despite the stalled economy. Turkey's current account deficit remains in the red-alert region of nearly 10% of GDP, and it continues to finance the deficit with short-term interbank borrowings. Bubbles like this eventually blow up. Turkey cannot blame global economic conditions, because emerging market economies are growing at 5.5% this year in the International Monetary Fund's estimate while Turkey is not growing at all. Turkey's government debt remains quite low at just 36% of GDP, but private-sector debt - especially short-term foreign debt - has tripled in the past four years. Most of the US$80 billion in short-term money that Turkey has borrowed since 2010 probably came from the Gulf states, which have a strategic interest in preserving a Sunni power with an army larger than Iran's. This largesse cannot continue indefinitely, though. Turkey's central bank promised to reduce its foreign deficit by reducing growth. Now the growth is gone, but not the deficit. The galloping increase in bank debt indicates that Turkish banks are lending their customers just enough to pay the interest on past loans. This puts Erdogan's political future in question. His Justice and Development Party (AKP) won the past two national elections on the strength of its economic record. Many Turks are caught in a consumer debt spiral, borrowing to pay a 32% interest rate on credit card obligations. Consumer spending has already started to fall. A few months more of this and Erdogan's mandate will start to crumble. Turkish import growth has stopped because consumption has stopped. Since consumer spending is falling, the 27% rate of credit card debt expansion (or 20% after deducting 7% inflation) must reflect Turkish households borrowing to pay the interest on their old debt. The prevailing credit card interest rate is 32%. It's not just consumers: total bank lending is growing at the same rate, which suggests that businesses are capitalizing interest (borrowing to pay the interest on old debt). Even with a stalled economy and zero growth in imports, Turkey's trade deficit is running at $6 billion a month, or $72 billion a year; that is, 9% of GDP. Since then, the US government has cracked down on this end run and Turkish exports have fallen. Turkey is borrowing in the short-term markets to cover its enormous trade deficit. Most of the borrowing comes through Turkish banks, which are taking on short-term loans from other banks. The Bank for International Settlements numbers are shown in Exhibit 8 below. The BIS doesn't identify the sources of the loans, but Turkish analysts presume that the Gulf states provide most of them. Turkey can't blame global economic conditions. Except for Indonesia, it is the only emerging economy that did not grow during the first quarter of 2013. And it has higher inflation than any emerging economy except for Argentina. To summarize what the data tell us: even at a dead stop, Turkey's economy is running a trade deficit of 9% of GDP, and financing the bulk of the deficit on the short-term interbank market. That is unsustainable in the long run, but there is no immediate event likely to trigger a crisis. The Gulf states can continue to keep Turkey afloat for some time. Turkish consumers, though, will have to tighten their belts to manage their debt burden, and the economy is likely to shrink moderately during 2013. Economic troubles will dominate the political agenda, and Erdogan's claim to leadership of the Islamic world - let alone his own country - will look far less credible. Related Topics: Turkey and Turks | David P. Goldman | Winter 2012 MEQ receive the latest by email: subscribe to the free mef mailing list This text may be reposted or forwarded so long as it is presented as an integral whole with complete and accurate information provided about its author, date, place of publication, and original URL.